Very useful. Keep it up. Thanks a lot. Thanks… Nice article. Help me do my work..
As i have null values i need to use ISNULL() function while sum, which i am not able to add. without this values for column level calculating as zero. How do I create the pivot table as a temp table that I can join to other tables? Very Nice and Very useful. Keep it up. Thanks a lot. I am trying to do a similar pivot table but I want to swap the rows and columns. I would like the Year to be dynamic. I currently have all my records with a datatype Datetime but only want to view year. I can get it working without dynamic columns but want to make the years dynamic, I am having problems I think converting the date into a year and then using it. It took me a while to figure most of it out. Compact code and works beautifully. One question: how can I include a ISNULL for replacing the “aggregated” as blank instead of NULL? 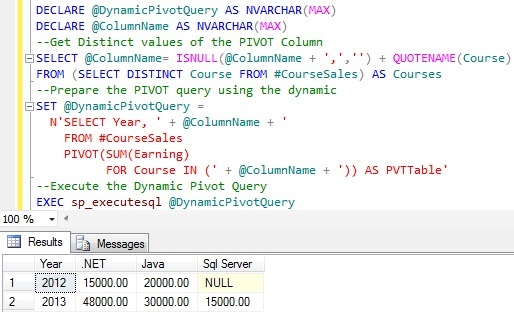 Must declare the scalar variable “@DynamicPivotQuery”. must be some typographic errors or you may not declare it in nvarchar..
this is not dynamic at all, because at the top of the query you are trying to find the pivot columns and writting these columns hardcoded so this is not exactly dynamic but half dynamic :)) but however this is great post thanks. Thank you very much , I got what I wanted. Thanks again. When i execute with my table it comes this error. I cant identified the error. I got the same error, did you ever get it resolved? Thanks! My query is working successfully, but some of the columns are not showing up. For instance, in the “Name” Column, I have the values “Object”, “Use”, and “Size” that I am trying to use as column headers, but only the Use and Size are appearing as headers. I can see Object as a value in the table I’m pivoting from, so I don’t know why it’s hidden. Can anyone help? how to set order by in dynamic pivot query. Thank you very much. I try it and it works fine. 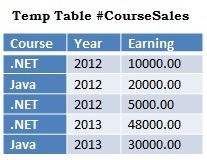 What I need now Is to add Grand total Column that sum all Earning for each year. thank you for help. This was supremely useful to me. Thank you! It helps me a lot to serve my customer. Helped me alot and time saving. This was very helpful thank you! Would anyone know how to create these parameters in SSRS as well? I have gotten the query to work successfully in SQL but I am now trying to create the report in SSRS and am not sure how to set the parameters.